What Is the Future of the American Mall? With All the Bankruptcies and Closings, How Will the Mall Survive? My first retail job in 1983 was at a RadioShack store in a small Indiana town. We had no POS system or any other technology to help us outside of the calculator we used to add up the numbers on the invoices. Our best-selling item was a computer called the TRS-80 that proudly boasted a memory size of 16kb. And that was mind-blowing! Technology is a game changer in retail. It has changed the way we shop, the way we browse, the way we process. It has brought the experience of shopping in a mall to our laps in our beds snuggly tucked in from the cold. In fact, there is more computing technology in the musical greeting card my daughter gave me for my birthday last year than existed on the planet in 1950. Malls were a brilliant social idea when they first started. People visited them for the convenience, but for most families, it was an outing. Malls not only had stores with wares they could purchase but also provided some entertainment as well. Malls even provided exercise as many mall walker clubs formed to circle the paths in the mornings before the stores opened. But 2017 has seen record numbers of store closings and bankruptcies. And this trend has placed malls in a dangerous position. How will malls survive if retailers are closing? Well, like all things in a capitalist economy, they reinvent themselves. General Growth (the number 2 mall developer in the US) has already begun the change. Their focus has been filling the empty anchor spaces with movie theaters and restaurants. Simon Properties (the number 1 developer) is following suit as well, only they are taking it one step further. Simon is replacing anchor spaces with "mixed-use developments." This includes office and even residential space. The future of city planning is mixed-use development where neighborhoods can be self-sufficient. In other words, you can live, work, play and eat all in the same neighborhood. So, what was once a shopping center focused on buying retail goods, is now a lifestyle center focused on meeting multiple needs for the consumer and not just shopping. I remember the day Walmart earned the number one spot on the Fortune 500 list. As a lifelong retailer, I never thought it possible that a retailer could get there. But truly, online shopping has changed the face of retail. Amazon's market valuation is now twice that of Walmart. But with all of its success, even Amazon has realized that there is a limit with online retail — meaning that people will only buy so much online. So if consumers still prefer stores over online, then the online giants have to open stores and that is exactly what Amazon is doing. However, these online retailers are not taking over the empty spaces in the malls just yet. While it makes logical sense, most online retailers are toying with alternative retail concepts and shying away from malls. What Does All of This Mean for the Independent Retailer? The American economy is built on the entrepreneurial spirit of the independent retailer and services provider. 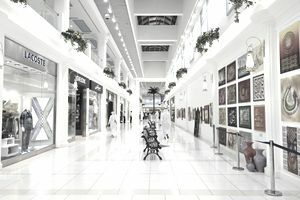 The shifting focus of the mall from a shopping center to entertainment and business center can only mean more opportunity for independent stores. In a recent study by Retail Perceptions, generation Z shoppers said they prefer to shop local (59 percent) versus national or even online. This is also good news for local retailers. Customers today want an experience. In fact, creating these experiences may become the new product retailers provide. And while this looks like the track we are on, it is very hard for a mall store to deliver. It requires a personal touch and a technology center that is a major shift for national chains that are the predominate tenant in malls today. And this makes it much easier for an independent to achieve. So the mall as we know it — a shopping center — is on life support. But don't pronounce them dead just yet. There is still some life in them, but it will be with less retail and other uses.